Today, I craved Chinese styled foods. Something about soy sauce that makes me start salivating! 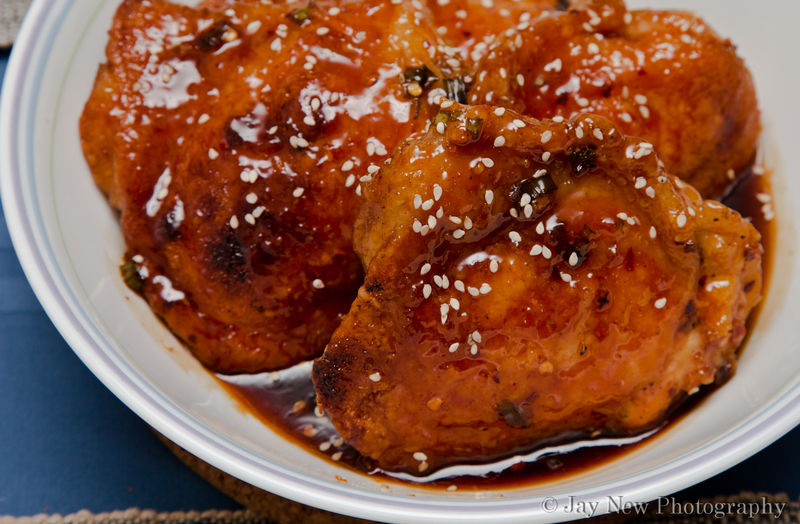 I decided to try my hand at making Orange Chicken. Normally, it is something I do not order, when I am at a Chinese restaurant because often times, there is way too much “orange” flavor that tended to be bitter and the dish was often too sweet. Adding my love for spicy, tonight’s dish seem to fit the bill perfectly. I think, however, when I make this again, I may add a touch more garlic. I think that the most important step in this whole dish has to do with the marmalade. Make sure you strain the marmalade of the white rinds before adding it to the sauce. The rinds will make the sauce bitter. Preheat oven to 350F and grease a baking pan with cooking spray. Allow sauce to boil for at least 5 minutes so it becomes thick. When chicken is cooked, turn on broiler and glaze chicken pieces with sauce. Hubster would like this! I love dark meat, he prefers white… but give him wings and he’ll eat dark meat! My husband liked this dish too 🙂 He commented that he normally hated Orange Chicken, from food courts but that this dish, he actually enjoyed. I was originally going to make this with wings too but decided to make it with what was on hand. Okay Samina, here’s the thing.. you have to get out of my head PRONTO lol. My fav. part of the chicken is the thigh. I know I should despise dark meat but I can’t. So seeing this got me so happy. I tried a recipe similar but not with chicken thighs so this maybe next weekends dinner. Wonderful recipe as always girl. Chicken thigh is my favorite part too! We are so alike its crazy!